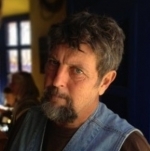 Gary Nabhan, an internationally-celebrated nature writer, agrarian activist and ethnobiologist, was the Convocations speaker Thursday in the Gilbert Great Hall in the R. Haze Hunter Conference Center. Nabhan’s presentation was titled “Conservation You can Taste: Restoring Biodiversity to the Farm and Table” and focused on efforts that are being made to bring back species of edible food crops. Nabhan also spent Wednesday making classroom visits and visiting with local farmers. The Convocations started with a showing of a short documentary that Nabhan has a featured role in called “Man in the Maze,” which won the Sundance Short Film Challenge in 2015. The film shows disparaging images of hundreds of thousands of pounds of fresh produce being dumped into landfills on the Mexico/U.S. border. Approximately 30 percent of the produce the U.S. consumes is imported from Mexico. If the U.S. has days where Florida-grown tomatoes are cheaper than Mexico-grown tomatoes, the semi-truckloads of produce are dumped, putting to rot perfectly good produce that no one gets to enjoy. Many people living in the Arizona border towns are food insecure— one in five Arizonans, according to Nabhan. The short film highlighted the Amado Produce Redistribution Outreach Service, which helps distribute produce in the community of Amado, Arizona. Nabhan pointed out that one reason people don’t get produce is because of the higher prices of fresh produce, as opposed to processed foods. Not only does Nabhan want people to eat more produce to live healthier lives, but his goals as an activist and conservationist are also to help unify and heal communities through food and restoring environments. Nabhan said he wanted to use his theme of food biodiversity to help mend tears in the recently heated political climate. “(Food is) not just healing our bodies, but healing our communities,” he said. A chart showing the number of species of common vegetables like corn, cucumbers, radishes and brussel sprouts said that within one century, the number of species (varieties) went from over 200 to 10 or 20. “Over four-fifths of our plant varieties disappeared in one century and some of those were thousands of years old,” Nabhan said. The lack of biodiversity in the supermarkets and farms has been recovering slowly, primarily because of the work of citizens. Nabhan was one of the original founders of Seed Savers Exchange (SSE) whose goal was to curate and preserve seeds from different plants. In 1985, SSE catalogued around 5,000 fruit, vegetable, herb, grain and nut seeds that were available on the U.S. market; however, only about 80 varieties of those 5,000 dominated the grocery stores. By 2013, grassroots organizations had contributed to the catalogue and now had over 22,000 available. Another example he gave of the influence of individual people on increasing biodiversity in U.S. food was reviving the number of species of turkeys that were available to purchase at the grocery store. Nabhan said there were only two species of turkey that were being sold in the supermarket. The United States Department of Agriculture (USDA) was going to drop its efforts into saving twelve other species of domestic turkey. It was grassroots organizations that took over the USDA project and they have successfully rehabilitated seven of the 12 species. Nabhan said people, regardless of political affiliation, generally have the same goals that will benefit the local community and economy. There are small organizations in many communities where jobs are created working in the grassroots agriculture movement. Not only do local agrarian efforts provide economic benefits for communities, but they also bring the communities together, providing examples of mulitgeneration projects in communities, bridging the generation gap through hard work that benefits local agriculture. “We, as citizens, students, ranchers, farmers, activists, cooks and eaters, wish to affirm our sacred vows to take care of, love and serve the astonishing diversity of species, landscapes, foods and faiths and their cultural communities here on this fragile earth, as well as the soil, water and wildlife precariously held within them, pledging to try to collaborate before we resolve to litigate so that we might heal wounds and calm nagging conflicts in time to keep this wounded planet from further spasms. “With gratitude and joy in our hearts we vow to sow the seeds of environmental justice, to glean the fruits of a functioning democracy, to ferment the brews of true food sovereignty, to savor the flavor of vanquishing disparity through our own humble actions and by curbing our own consumptive patterns so that we may all eat what we have truly sown. “We hereby renew our covenant with this earth to humbly become one more way that the seeds of equity regenerate into more seeds to nourish all of us. Megan O’Sullivan, a senior sociology major from Cedar City, said she came to the Convocation because she loves studying food in anthropology and cultural contexts.